My name is Ree. Some folks know me as The Pioneer Woman. After years of living in Los Angeles, I made a pit stop in my hometown in Oklahoma on the way to a new, exciting life in Chicago. It was during my stay at home that I met Marlboro Man, a mysterious cowboy with steely blue eyes and a muscular, work-honed body. A strict vegetarian, I fell hard and fast, and before I knew it we were married and living on his ranch in the middle of nowhere, taking care of animals, and managing a brood of four young children. I had no idea how I’d wound up there, but I knew it was exactly where I belonged. 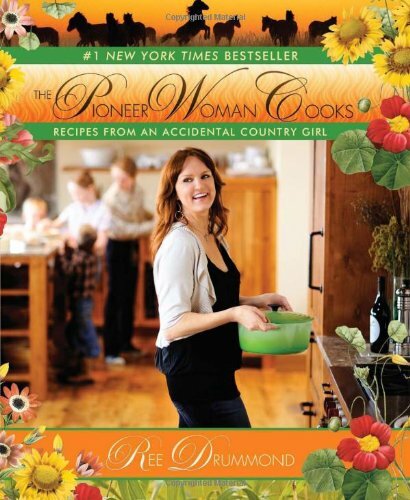 The Pioneer Woman Cooks is a homespun collection of photography, rural stories, and scrumptious recipes that have defined my experience in the country. I share many of the delicious cowboy-tested recipes I’ve learned to make during my years as an accidental ranch wife—including Rib-Eye Steak with Whiskey Cream Sauce, Lasagna, Fried Chicken, Patsy’s Blackberry Cobbler, and Cinnamon Rolls—not to mention several “cowgirl-friendly” dishes, such as Sherried Tomato Soup, Olive Cheese Bread, and Crème Brûlée. I show my recipes in full color, step-by-step detail, so it’s as easy as pie to follow along. You’ll also find colorful images of rural life: cows, horses, country kids, and plenty of chaps-wearing cowboys. Howdy. I’m Ree Drummond, also known as The Pioneer Woman. Welcome to my frontier! I’m a ranch wife, mother of four, moderately-agoraphobic (self-diagnosed) middle child who grew up on the seventh fairway of a golf course in a corporate town. I attended college in Los Angeles and wore black pumps to work every day. I ate sushi and treated myself to pedicures on a semi-regular basis. I even kissed James Garner in an elevator once. Then, on a brief trip to my hometown, I met and fell in love with a rugged cattle rancher. Now I live in the middle of nowhere on a working cattle ranch. My days are spent wrangling children, chipping dried manure from boots, washing jeans, and frying calf nuts. I have no idea how I got here…but you know what? I love it. Don’t tell anyone.